If you’re looking to add some excitement, ‘zip’ or ‘buzz’ to your go club program, GoClubsOnline’s Robert Cordingley has some suggestions. “One way is to run face-to-face tournaments in which players compete to win prizes, improve their ratings or just accumulate accolades!” says Cordingley. 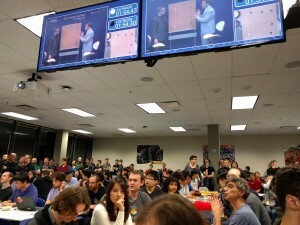 Another idea is running a Pair Go tournament. 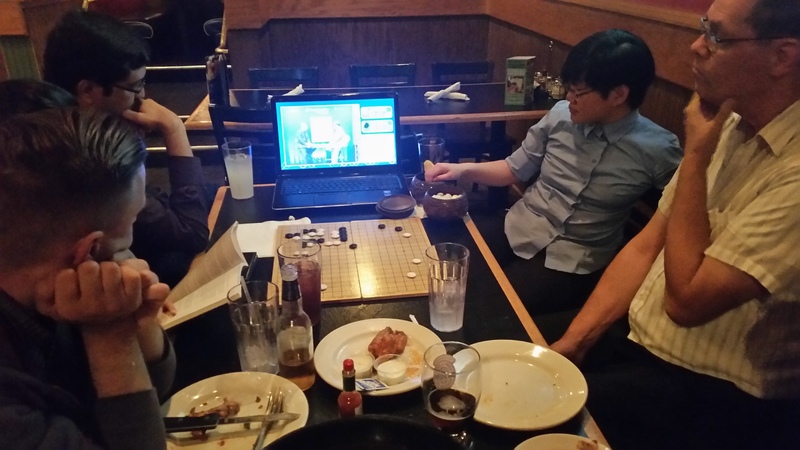 A popular feature of the annual US Go Congress, “Pair Go might be a little daunting for a club to run but is now much easier because they are supported in the latest release of GoClubsOnline,” says Cordingley. From registration to forming teams, calculating team ratings and generating pairings, GoClubsOnline gives TDs the tools they need. Click here for details. Leading contenders for this year’s New Jersey Open championship are Mark Lee 7d and Michael Chen 7d, both 3-0 after the first day of play. 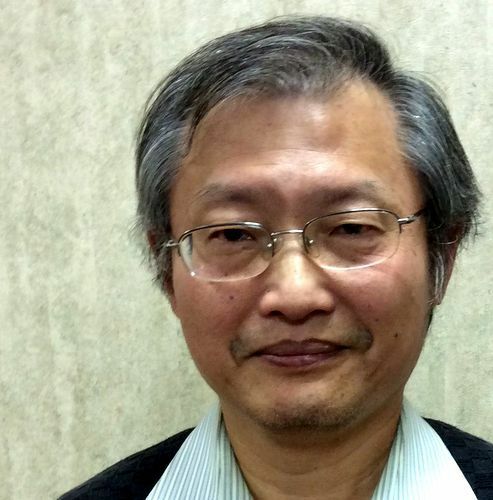 Eric Lui 1P and Zhengbokang Tang 7d are also in the mix at 2-1. The first round of the Open began promptly at 10a on Saturday, thanks to required online pre-registration. The 154 players got three rounds in by 6p, helped along with Fischer timing, and will return for the two final rounds on Sunday. Click here for tourney data, including round-by-round pairings/results, and updated player ratings. Click here to see tourney photos on the AGA’s Twitter feed. 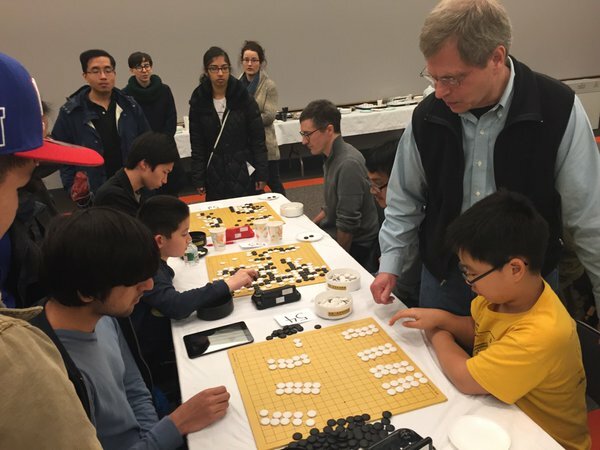 The Davis/Sacramento Go Club held its Spring Tournament at the Arcade library in Sacramento on March 5th. There were eleven players, most from the San Francisco Bay area. 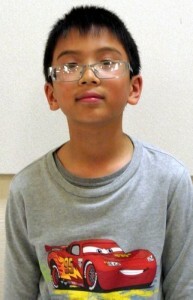 Matthew Cheng 2D (right) won Division I, and Tai-An Cha 4K (won Division II for the 12th time in our last 15 tournaments. Both players had 3-1 records. The E-Journal has extensively covered this now world famous historic match. For a starting point on post-match coverage and references, click on this E-Journal article . 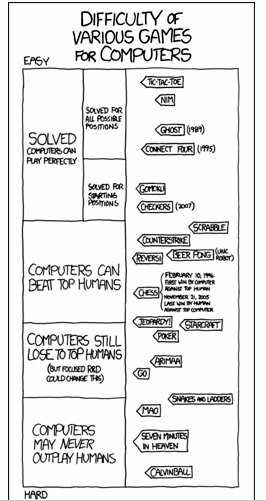 For extensive and insightful commentary on the games, also visit the YouTube channel: AlphaGo vs. Lee Sedol 9p , in which Michael Redmond 9p analyzes every facet of the games with E-Journal Editor Chris Garlock. 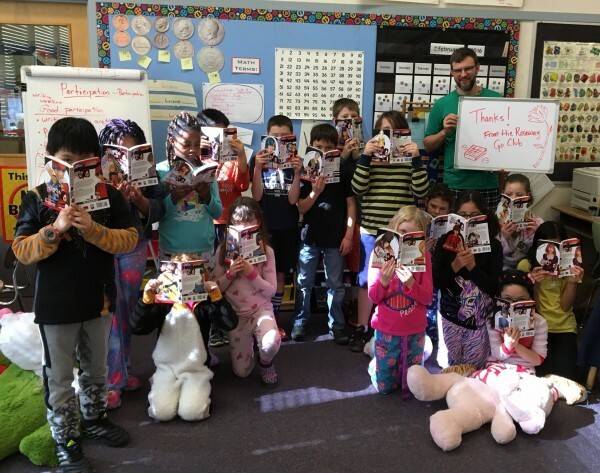 “I want to offer a huge thank you the AGF,” writes third grade teacher Ben Ellenwood, from Portland, OR. 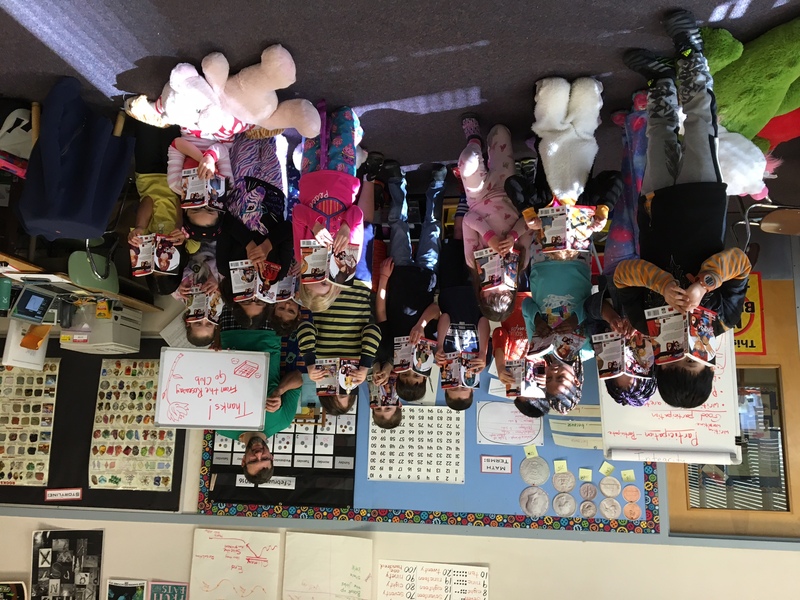 “I can’t tell you how into these books the kids are! There is a sign up list half a page long and one student has already read 4 of them. We will take good care of them and they will be well loved.” All 23 volumes of Hikaru no Go are available for free, to schools and libraries, from the American Go Foundation. AGA chapters can also now order the sets as long as they are for club (and not personal) use. More info on Hikaru is here. -Paul Barchilon, E-J Youth Editor. Photo by Ben Ellenwood. Registration for this year’s US Go Congress — July 30-August 7 in Boston, MA — is now open: click here. Check back regularly for more updates on tournaments, activities, attending pros, and more. Important: this year, the policy for minors is more stringent, please contact the registrar directly at registrar2016@gocongress.org to make sure that you have completed all procedures before Go Congress. 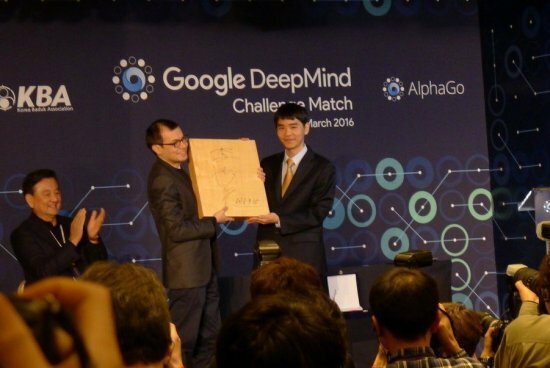 Chris Garlock will discuss the AlphaGo-Lee Sedol match Friday March 18 on the “World’s Finest Show” on WCHE 1520 AM, tune in worldwide via the listen live button at the top. Garlock commented the match with Michael Redmond 9P. 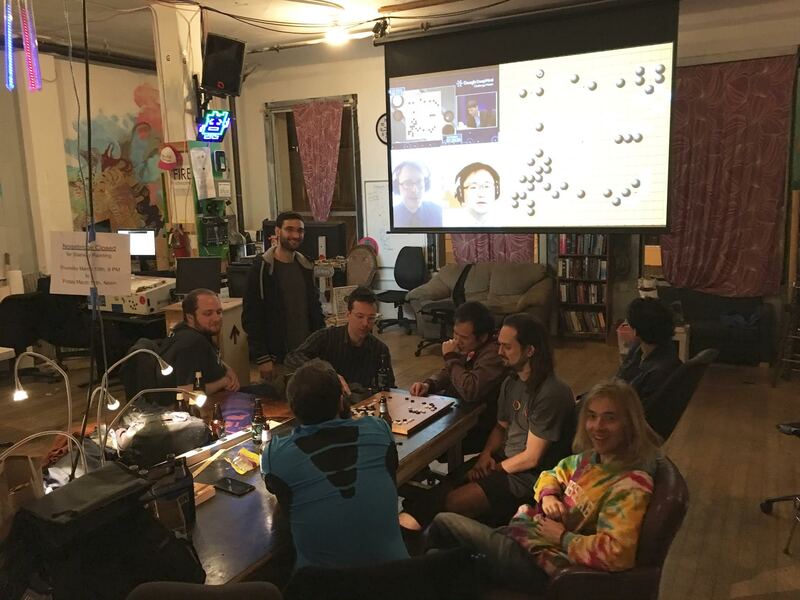 “Here’s a picture of us watching game two of the incredible Alphago vs. Lee Sedol match at Noisebridge hackerspace (left) in San Francisco,” reports Mishal Awadah. The SF Go club is offering a 10 week beginners go class starting on March 20th for anyone interested in learning the game. 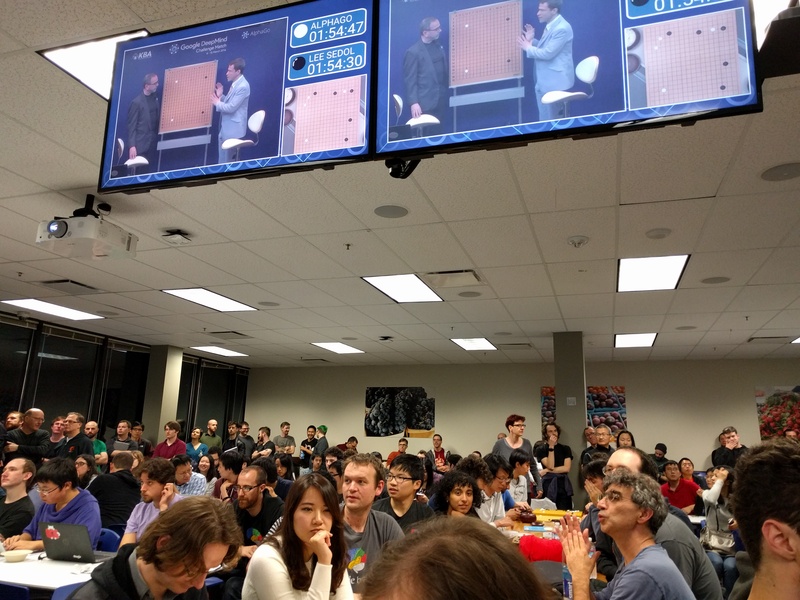 And Lee Schumacher sent in this shot of a watch party at the Google Mt. View campus (right). The New Jersey Open will be held this weekend in Princeton, New Jersey in the Frist Campus Center. Pre-registration and pre-payment are required this year: register here by Thursday, March 17. When you arrive, there will be a check-in sheet at the registration desk and initial pairings will be posted. Check your name off on the list. DO NOT START PLAY until the designated start time of 10 AM. Announcements and attendance check will begin at 9:50. If you are not there, you will be removed from the first round. Cell phones don’t work at the site, but if you’re lost or late, call 609-851-6351 during the last half hour of check-in. Trains from NY/Phila arrive at 9:36. We suggest a taxi to Frist in order to arrive on time.